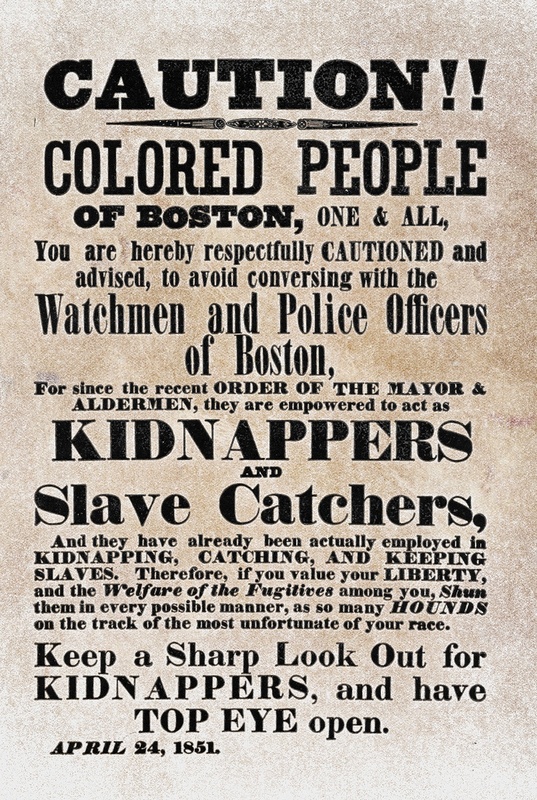 A flyer distributed by abolitionists in Boston in 1851. Where do the police come from? Fast forward to 2015, a year when police in the United States killed 1,207 people. Young Black men are five times more likely to be killed by the police than White men of their same age. Simultaneously, the police are under perhaps the greatest scrutiny they have ever faced as an institution in this country. The riots in Ferguson and Baltimore and Oakland, the occupation of a police precinct in Minneapolis, and the waves of solidarity marches, riots, blockades, highway and bridge takeovers, and economic disruption that followed, have all brought tremendous attention to police training, their technologies, their structure, and their individual members. Some of this attention is the managed product of media outlets and politicians during an election season, almost totally divorced from the lived elements of unrest of the past two years. However, there are also many people asking real questions about the history and role of the cops, and what it could be like to live without them. In the downtimes between national crises around unarmed police killings, all but the tiniest sliver of our society's discourse around the police isolates that institution as a “natural” arm of that other great “natural” phenomenon, the law––and as a phenomenon without a history. We can read this discourse in part as a set of creation myths, meant to justify the unique power the police have over life and death. And so it is not surprising that the logics of reform and progress, which seek to better but not break with society, rest on an assumption of the inevitability of the police, prison, and the law. But we show here that the police have a beginning, and so may also have an end. We present this piece not as a work of original research, but as our own collected notes and understanding of these inextricable links between slavery, capitalism, police, and civil society. We write this not simply to “set the record straight” on the history of police, as many have already done that work more completely elsewhere, but to understand how that might speak to our ongoing efforts to destroy the system that has been imposed upon us. For the next two years, Joe remained at large, his legacy and band growing all the while. Joe and other maroons, with whom he communed and conspired, survived in a well-fortified camp at the headwaters of the Santee River in the densest swamp between Georgetown and Columbia—impenetrable to outsiders. The hanging of Jack in 1821, of Denmark Vesey in 1822, and the shooting of Joe in 1823 did not mean defeat for fugitive slaves in South Carolina, and both maroonage and northward escape would continue to pose viable threats to slavery up through the Civil War. Meanwhile, by 1839, the constitution of the Pineville Police Association clearly stated its purpose as “the enforcement of a rigid system of police and the suppression of all traffick with slaves.” The documents left behind from the courts, the newspapers, and the small town police in the wake of Joe Forest’s capture and death foreshadow a world 200 years later––a world where the FBI is still issuing rewards for self-identified fugitive slaves. Assata Shakur, an invaluable part of the Black liberation movement of the seventies, lives in political exile in Cuba where she identifies as a “20th century escaped slave.” Shakur fled the U.S. prison system after enduring an unfair trial, in which she stood accused of killing a New Jersey cop during a traffic incident on May 2nd, 1973. Thirty years after the shooting, on May 2nd, 2013 the FBI renewed their investment to hunt down and capture Assata and now offer two million dollars for her extradition to the United States. The example of Joe Forest's rebellion and the emergence of Pineville’s original Police Association offers one poignant snapshot of the origins of the police in the South. A broader picture, including the roles and development of policing bodies in both rural and urban areas, offers some more insight. Officially designated by authorities as “slave patrols,” “alarm men,” or “searchers,” and nicknamed “paddyrollers” or “paterolers” by those they policed, these emerging institutions changed during the 18th and 19th centuries in ways that directly foreshadowed the institutional and structural character of modern police forces. Patrols of this kind were empowered to capture runaways and beat slaves caught travelling without a pass. As concerns of active revolt took hold, they would preemptively break up slaves' gatherings, search their homes, and seize their possessions. The distinction is important: the patrols performed their activities not simply as hastily assembled bands sent out to catch a group of runaways or put down an ongoing revolt, but as a preventative body of racial, social and labor control. In many places, these patrols were also tasked with governing disorderly Whites, in particular vagrants, outsiders, and those who would trade with fugitives and maroons. The authority of slave patrols typically lay with the militia at first, though this changed. In Mississippi, for example, the patrols were first performed by federal troops, then by militiamen, then finally by groups of White men appointed by the county. Many rural patrols started off as temporary or part-time, and eventually transitioned to full-time policing bodies. Accompanying those changes was the specialization of the police themselves. Though it varied across the South, in many places these patrols evolved from groups of able-bodied, White, male volunteers to paid employees, sworn in by the state and thus indemnified against lawsuits. Though they varied in pace by city and region, these developments in social control—the slave patrols' preventative function; their specialization as a paid, permanent force; the establishment of civilian rather than military control over the patrols, ultimately by municipal authorities; and the patrols' role in policing racialized neighborhood territories of early industrial workers—all point directly towards modern policing. These forces were already a modern (and modernizing) apparatus of social control long before the Civil War. The modernity, industry, and racial “reconciliation” of the post-war period, imposed in part by Northern liberators, directly relied on and enhanced the role and structure of police. The Reconstruction period resulted in a power vacuum in much of the South, whereby experiments in freedom and self-determination could be undertaken with newfound brazenness. Maroons in places like North Carolina’s Great Dismal Swamp and the Sea Islands continued their efforts at communal life, while former slaves in places like the Ogeechee Neck of lowcountry Georgia armed themselves, raided rice plantations, and occupied the(ir) land, declaring, “No Whites between the Ogeechees!” In Robeson County, North Carolina, a band of Lumbee Indians, former slaves, and disaffected Whites called the Lowry Gang exacted revenge on the plantation aristocracy by assassinating former Confederate officials, expropriating and redistributing crops, and refusing to work in the industrializing sectors of the economy. The “two evils” against which the Bureau had to contend, an army officer observed in July 1865, were “cruelty on the part of the employer and shirking on the part of the negroes.” Yet the Bureau, like the army, seemed to consider the Black reluctance to labor the greater threat to its economic mission. In some areas, agents continued the military's urban pass systems and vagrancy patrols, as well as the practice of rounding up unemployed laborers for shipments to plantations. Bureau courts in Memphis dispatched impoverished Blacks convicted of crimes to labor for Whites who would pay their fines. Ultimately, there evolved in the post-war period a “hybrid” system of discipline and social control in the South. This system integrated private forms of discipline consistent with the plantation, the publicly authorized rural and urban patrols alongside Northern judicial practices, institutions of social work and management like the Freedmen's Bureau, and industrialized modes of work and the wage. This meant that although there were already modernizing police forces in the South before the end of the war, those forces had to adapt to the post-war realities of controlling wage labor, unemployment, urbanization, and social codes of segregation all without the “help” of a legalized system of slavery. It's beyond the scope of this piece to further elaborate on the continuity of anti-Blackness and White supremacy endemic to policing and the law after the period of Reconstruction. Suffice to say, White supremacy in America remained both literally and figuratively business as usual into the 20th century, during the periods defined by convict leasing, Jim Crow segregation, and the country's massive prison boom—the “afterlife of slavery” as author Saidiya Hartman has put it. Our interest here lies in considering how 21st century policing in fact fulfills the conditions of both perspectives. The police undeniably coerce labor participation in the capitalist economy and thereby reproduce patterns of forced labor, for example by securing unpaid labor for prison facilities, or by preventing acts of collective expropriation, criminalizing lifestyles that resist wage work, and policing the boundaries between the legal/illegal economies, all of which forces those without capital to sell our labor for a wage. Likewise, it's just as possible to see how police continue to fulfill the conditions of slavery identified by Patterson, for example by breaking up familial connections via the mass removal of Black bodies from their communities into the prison system, destroying Black social organization with programs like COINTELPRO, or enacting limitless violence against young Black people in poorer neighborhoods across the country. These are just some of the questions attending to the history of slavery and policing, as those forces continue to haunt both normal, daily life as well as the increasingly common moments where that normality is ruptured in some way. But slavery doesn't just hover in the background like a specter from another century; it actively tells us who we are and where our loyalties lie, it distinguishes the dead from the living, it holds the keys to prison cells and patrols our streets. Most of the research for this section can be found in the new edition of Kristian Williams' excellent and exhaustive book, Our Enemies in Blue: Police and Power in America. Kristian Williams, Our Enemies in Blue: Police and Power in America. (Oakland: AK Press, 2015). One is reminded of the 1984 Comprehensive Crime Control Act which, among an array of get-tough-on-crime policies, expanded the state's ability to seize the assets of convicted or accused drug dealers. The act established a direct and ingenious tool for the financial reproduction of the departments themselves. Neal Shirley and Saralee Stafford, Dixie Be Damned: 300 Years of Insurrection in the American South. (Oakland: AK Press, 2015), 248-249. Frank Wilderson.”’We're Trying to Destroy the World:’ Anti-Blackness and Police Violence after Ferguson.” Chicago: Ill Will Editions, 2014. The kids don’t understand the racial history of America, not fully. What six-year-old could metabolize it? But its present is never far from their minds. Knowledge is power. Educate kids, and they will fight for their freedom. Black Mountain College produced some of the most famous poets and artists of the 20th century. Today, as tuition rises nationally, and state universities consider sweeping reforms, & the tale of Black Mountain's life grows increasingly relevant.